Of all the pumpkin products I've tried this year, I think this one's the most underrated. It certainly doesn't have the internet buzz that many other fall foods do this year, but sometimes the best things come when they're least expected. This beverage certainly isn't much to look at. But dishwater gray or not, this stuff is sweet and flavorful, and in my opinion, exactly what you'd want a pumpkin chai to be. There's still plenty of classic chai spices in the mix, like clove and cardamom, but they blend very nicely with the more pumpkinesque spices like nutmeg and allspice. And it seems as if both types of drinks traditionally contain ginger and cinnamon. Mix it all together with sugar and a base of black tea, and you have yourself one tasty, exotic brew. 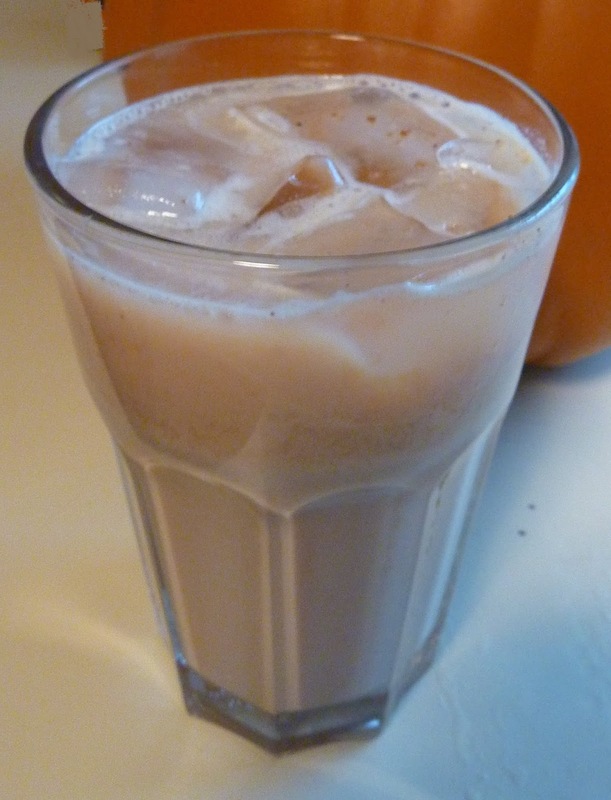 I'm generally into cold beverages more than hot ones, so I followed the directions for a "cold chai latte," pouring the drink over ice after mixing. I substituted water with milk. I tried both almond milk and cow's milk, and I honestly think almond worked best with this mix (although there is powdered nonfat cow's milk in the mix already). You really have to stir this stuff like crazy to get all the little crystals to dissolve in the liquid, but the excessive agitation not only swirls all the ingredients together, but gives the drink the slightest bit of foaminess, too. The tea definitely has some caffeine in it, so get ready for a little buzz with your beverage. Now I must admit that some of that buzz just might be from the sugar, though. Sonia thinks the mix is too sweet, so she simply used less of the mix in her milk. 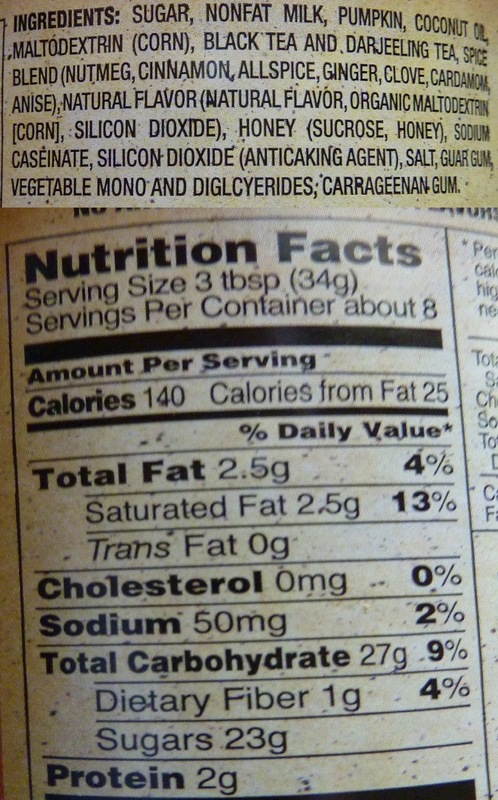 I guess 23 grams of sugar per serving safely excludes this product from the category of "diet drink," but it's still significantly less than say, a can of coke, for perspective—and sweet-toothed me drank it up like a fat kid at a soda fountain. At $3.99, a can containing eight quality chai lattes is a decent deal. Sonia is still holding steady with her string of solid four's for this year's pumpkin blitz. This time, I'm going with four stars also. I totally disagree with you. I drink their usual chai mix all the time and thought the pumpkin one was disgusting and I couldn't drink more than one sip ! This will be one I will take back and take advantage of their fabulous exchange policy !! I totally agree. This stuff is gross. I'm looking for a poor innocent soul to unload my canister on after making it once. Thanks for this review --- I wanted to go buy some, but they were already sold out! Not just this mix, but the pumpkin spice rooibos herbal blend too! You're welcome! Hope they get some back in stock. Pumpkin chai from Starbucks is delicious. Not at all like this stuff. I wouldn't write off all pumpkin chais based on this atrocity. 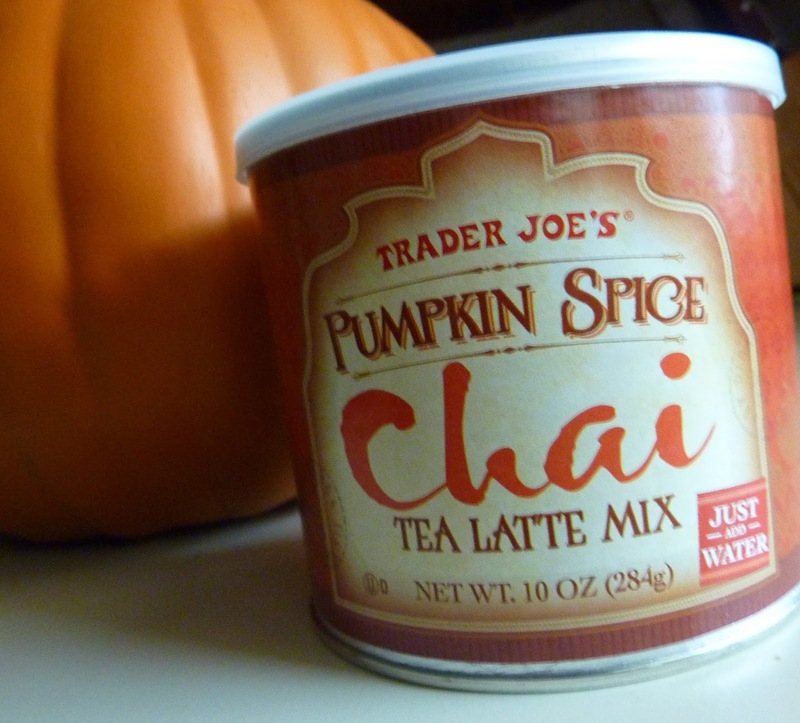 I love chai, I love pumpkin, but I hate both their chai and pumpkin chai latte mixes. Honestly the worst thing I've ever bought at TJs. It's the only product I've ever taken back because of it too. Blech.